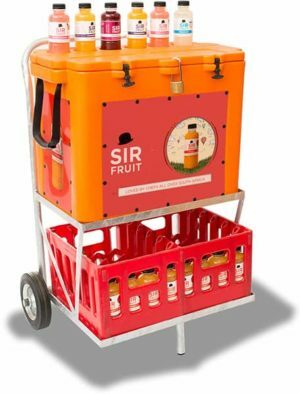 The Mini-Mobile Trolley is the global standard for informal vending of 4 cases of 300ml glass bottles. The Mini-Mobile Trolley is a robust unit that has a galvanised steel or powder-coated frame that is extremely strong. 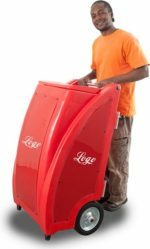 The heavy duty all-terrain wheels ensures that the Mini-Mobile Trolley is ready for any environment. The storage shelf has space for up to 2 cases of product. The Mini-Mobile Trolley can also support the 50 litre / 60 litre / 65 litre / 70 litre cooler boxes. This unit is ideal for mobile vending at stop streets, events and informal venues. 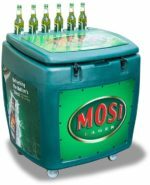 Global standard for informal vending of 4 cases of 300ml glass bottles.